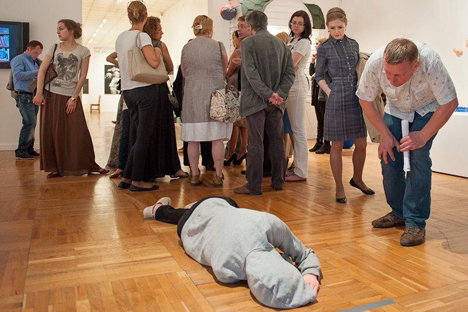 The department of contemporary art at the State Tretyakov Gallery in Moscow removed the Arseny Zhilyaev’s sculpture of a worker sleeping on the floor. Some of female visitors allegedly fainted when they saw this sculpture. Arseny Zhilyaev’s “Dreamer” sculpture, which depicts a worker sleeping on the floor, has been removed from the department of contemporary art at the State Tretyakov Gallery in Moscow. The reason is the repeated complaints of female visitors, some of whom allegedly fainted when they saw the statue. “My sculpture is called ‘Dreamer’; it is a dummy that represents a sleeping worker at an image-processing shop, who fell asleep after a 15-hour shift. It is part of the imaginary museum of the history of the future presented as a dummy installation; you will find things of this kind in any museum of applied arts,” the artist Arseny Zhilyaev told Gazeta.ru. “The sculpture includes an explication that recounts the well-known story [of] Ivan Shchegolev – a worker at an image-processing shop who fainted after a 15-hour shift due to lack of sleep. It was then that he knew he needed to make some radical changes to his life. He became one of the heroes of the oncoming uprising, and the sculptures of sleeping workers in the Socialist world of the future will decorate almost any work area,” said Zhilyaev. According to Zhilyaev, the order to remove the sculpture was signed by Tretyakov Gallery Director Irina Lebedeva. The gallery’s press service the told Lenta.ru that the work was indeed removed from the “Documents and Monuments” exhibition, though the change came as little surprise. The display, which opened in April 2012, was expected to remain unchanged until August 2013. Head of the gallery’s contemporary art department, Kirill Svetlyakov, told Lenta.ru that there were several (two or three) complaints made by visitors (mostly elderly females), who thought that they had seen a dead body. Svetlyakov said that the gallery guestbook contains a single complaint of “moral damage” – a visitor started to feel unwell after seeing Zhilyaev’s work. There is no evidence that the visitor fainted, though. “The Tretyakov Gallery should not display the kind of art that is catered for by other venues; these places of modern art have their own target audience. We have a totally different objective. Our mission is to ‘museumize’modern art and display it in the classical museum format,” Lebedeva told Gazeta.ru. “I always aim to present modern art in a more traditional, classical form, in order for everyone to understand that it has become part of the history of art. This is my decision. I told Svetlyakov from the start that the exhibit was out of place, that it’s not the right thing for the State Tretyakov Gallery,” said the gallery director. “The story is quite absurd. Imagine how it looks to a casual observer: ‘The Tretyakov Gallery gets rid of a “scary sculpture”’ or ‘a creative worker taken out of the Tretyakov Gallery feet first,’ ‘the phantom of a proletarian of the future awes visitors.’ The scary statue appears to be a museum dummy. The very situation when a museum director makes an arbitrary decision and interferes in another curator’s display seems disrespectful to the work of their employees, the artists and the public,” Zhilyaev says. Arseny Zhilyaev is a recipient of the 2010 Innovation Award and 2010 and 2012 Soratnik Award. He has had personal exhibitions in the Tretyakov Gallery and the Regina Gallery; his works have also been displayed in Garage, Moscow Museum of Modern Art and at the III Moscow International Biennale for Young Art.